If you and your family love waffles, then you should know that the best waffles are those that you make yourself. You can mix the batter with whatever extra ingredients you want to make them extra tasty and then cook them. The easiest way to do this is with a waffle maker, and there is no need for an over-sized one that takes up half your counter-top. In this article we are going to look at three of the best thin waffle makers and explain how they can help you make delicious waffles every time you use them. 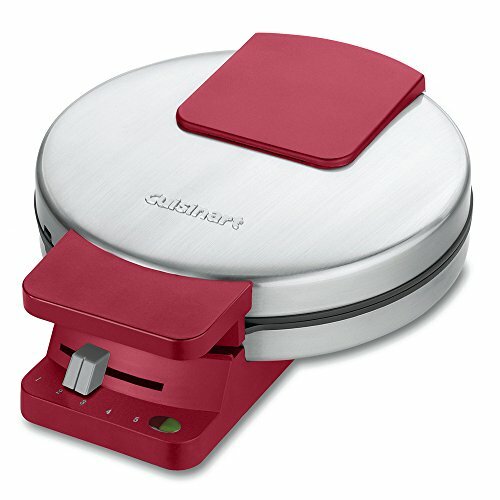 Cuisinart is a brand with a very high reputation for kitchen gadgets and this thin waffle maker is one which will do nothing to damage that reputation. Easy to use, it is ideal for making delicious waffles with the minimum of fuss. The first thing that strikes you about this thin waffle maker is how light it is in terms of its weight. With many waffle makers doubling up as bodybuilding equipment these days it is great to see one that weighs only just over 4 pounds. This makes it very portable and easy to move as you take it out or put it away after use. Its size also makes it very convenient, with a diameter of 9 inches and a depth of only 3 1/4 inches, so it is not going to take up much room in whatever cupboard you store it in. This size also means that it is just right for cooking waffles for one or two people at a time. To be exact, the waffle it cooks is one large round waffle, although it has lines across it which allow you to divide the waffle into two or four equal portions. Whether you prefer your waffles lightly browned, or much darker, you will be happy to know that with a browning control that has five settings, you can brown your waffle exactly the way you like it. To ensure it is not over-cooked there is a thermostat which regulates the heat. To help you further, there is a red indicator light to let you know that the waffle maker is up to temperature and ready to cook, so you can then pour in your waffle batter. When it has cooked to the browning setting you have chosen, a green indicator light then tells you it is ready. This Cuisinart thin waffle maker is manufactured with two non-stick baking plates so there is no danger of any mess inside. The outside is also protected thanks to the main body of the waffle maker housing being made from brushed stainless steel which gives it a nice look and compliments the red trim. You will likely have your favorite waffle recipes which you be keen to make, but if not, or if you’d like new ones, you’ll be pleased to know that the instruction manual contains some delicious waffle recipes for you to try. Black and Decker is a brand name you might normally associate with DIY and gardening tools, but they also produce high-quality small appliances for the kitchen too. 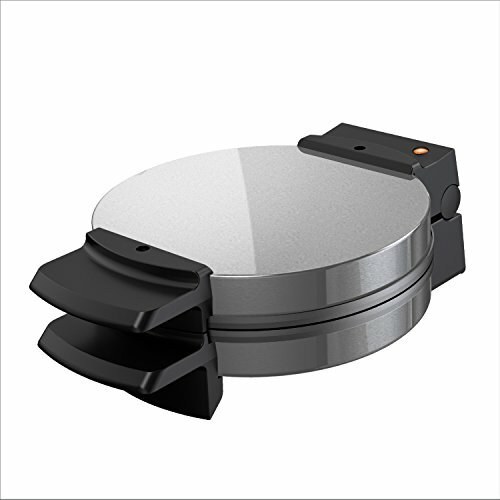 Their thin waffle maker is ideal for breakfast, a quick snack and even main meals, when you want waffles for dessert. Getting your Black and Decker thin waffle maker up and running, is as simple as plugging it in and waiting for it to heat up. An indicator light on top lets you know when it has reached the optimum heat level and is ready to cook. Then you pour in your waffle batter and close the lid. Once your waffles have cooked the indicator light will come on again to let you know they are ready. The grill plates are round, and divide your waffles into four quarters, making it easier for you serve whether you are making them for yourself or for your family. The grill plates also impress the traditional crisscross design into the waffles that we all know and love. When serving, the cool-touch handle makes it easier for you maneuver the grill, without any danger of burning your hands or fingers. Your waffles are cooking, you’re savoring the smells, but whilst your mouth starts watering in anticipation, nothing is more annoying than to find that your batter has stuck to the cooking plates and instead of eating a delicious waffle, you are left to clean up a mess. With this Black and Decker thin waffle maker that should never happen thanks to its non-stick plates which ensure that your waffle is ready to serve without any scraping. The other benefit of the non-stick plates is it means this waffle maker can be used for a variety of treats. You can grill sandwiches, hash browns, and even brownies in it, so there is no shortage of tasty alternatives that you can try out. This waffle grill is very light, so it is easily moved to wherever you plan to cook your waffles. It allows you to cook waffles up to 7 1/4 inches in diameter, so it is small enough that no matter where you store it, it’s not going to take up too much room. Space-saving is also helped by the fact that it can be stored vertically. The styling is relatively straightforward with a stainless steel and black coloring, so it should look great in any kitchen, and with a price of less $20, it is going to keep your bank balance looking good too. If you are looking for a thin waffle maker that offers you more than just basic features, then this could be the one for you. It gives you several cooking options and makes waffles as fast or as slow as you want it to. This Chef’s Choice thin waffle maker cooks waffles in exactly the way you tell it to. First, you have the choice of the texture of your waffles, which is essentially how crispy you want your waffles to be. You can either have them very crispy or if you prefer them a bit softer then it can make them that way for you too. The choices don’t end there because you can also select how brown you want this thin waffle maker to cook your waffles. If you prefer a light, golden color then it will cook your waffle this way, but if you like a darker brown this can also be done. Another great feature is the overflow channel, which removes excess batter liquid so that when you close the grill lid, there isn’t batter spilling onto your countertop. As you’d expect the cooking plates are non-stick, so cooked waffles are easy to serve up, and cleaning up afterwards is also made easier. Whichever options you have chosen for the color and texture of your waffles, when they are ready you would normally expect a light to come on and this waffle maker does that, however, it goes a stage further. Just in case you have been distracted or called away, it also beeps to let you know your waffle is ready. One issue that can arise when cooking waffles using a thin waffle maker is uneven thickness. This is caused by the lid not being in an even position when it is closed. Thankfully, the Chef’s Choice waffle maker addresses this with a ‘floating hinge’ which ensures the lid closes evenly and remains that way, so your waffle has an even thickness. 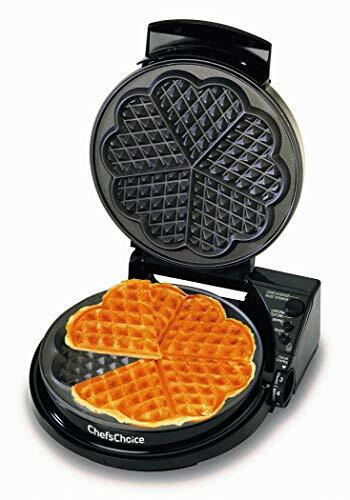 This thin waffle maker’s cooking plates are shaped in such a way that it creates a unique ‘five of hearts’ design on your waffle. This means you can either have one large, beautiful looking waffle or divide it up into five equal portions, which are all heart shaped. This means this waffle maker is ideal for creating fun-shaped waffles for kid’s parties, or family meals. Each of the three thin waffle makers will make great waffles, and we are happy to recommend them all. However, if you are looking for the best thin waffle maker then the top option is the Chef’s Choice Waffle Pro 830. It has a ton of great features which the others can’t really match, and although it has the highest price of the three, it is worth paying a little bit extra for them. It lets you choose the color and texture of your waffles, so they are cooked exactly the way you like them, and when ready it not only has an indicator light, it will also beep to tell you. If you pour in too much batter it has an overflow to keep things from getting messy, plus when you are finished it even has chord storage built in.